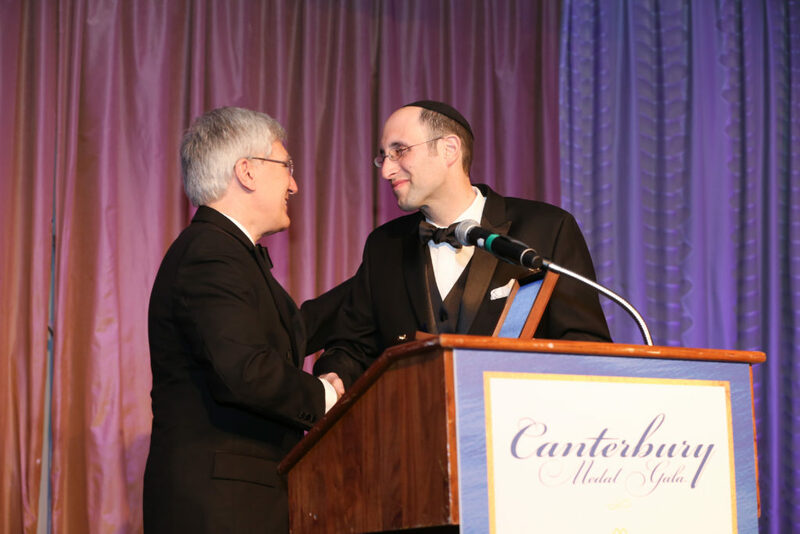 NEW YORK – Rabbi Dr. Meir Soloveichik, Orthodox rabbi and spiritual leader of the oldest Jewish congregation in the U.S., received the Canterbury Medal for his public defense of religious liberty last night at Becket’s Canterbury Medal Gala. The Canterbury Medal is Becket’s highest honor and recognizes an individual who has demonstrated courage and commitment to defending religious liberty for people of all faiths. Becket also honored law firm Baker Botts with the Legal Service Award for its pro bono work protecting religious liberty for Native Americans. A descendant of a long line of renowned Orthodox rabbis, Rabbi Dr. Meir Soloveichik is the spiritual leader of Shearith Israel, the oldest Jewish congregation in the United States, founded in 1654. An advocate for the Jewish faith and religious freedom, Rabbi Soloveichik works tirelessly alongside religious leaders of diverse faiths to strengthen interfaith relations in America. He also holds a Ph.D. in religion from Princeton, serves as director of the Zahava and Moshael Straus Center for Torah and Western Thought at Yeshiva University, lectures in a wide range of public forums, and has been published extensively including in The Wall Street Journal, The Forward, and the New York Times. This year’s Legal Service Award winner, Baker Botts, has donated hundreds of hours of attorney time to advocate for equal treatment of religious people in public life. Among other cases, Baker Botts represented members of the Lipan Apache Tribe of Texas in a lawsuit against the federal government after an undercover agent raided the tribe’s powwow and confiscated their sacred eagle feathers. Baker Botts also represented the Roman Catholic Archdiocese of Galveston-Houston in a brief supporting Becket’s case seeking equal access to FEMA funds for houses of worship following natural disasters. “As the leader of a prominent congregation, Rabbi Dr. Meir Soloveichik has worked side-by-side with leaders of diverse faiths to preserve religious liberty for all. He has rightly earned this year’s Canterbury Medal. I am confident his work as a defender for religious liberty has just begun,” said Bill Mumma, CEO and Board Chairman of Becket. The Canterbury Medal draws its name from one of history’s most dramatic religious liberty standoffs, which occurred between Archbishop of Canterbury Thomas à Becket, the law firm’s namesake, and King Henry II of England. The annual Canterbury Medal Gala to honor the medalist is a black-tie event held at the Pierre Hotel in New York and is attended by the world’s most distinguished religious leaders and religious liberty advocates. Past medalists include the late Nobel Peace Laureate and Holocaust survivor Elie Wiesel, Cuban poet and former political prisoner Armando Valladares, Supreme Knight of the Knights of Columbus Carl Anderson, New York Times bestselling author and radio host Eric Metaxas, Learned Hand Law Professor Mary Ann Glendon of Harvard, Elder Dallin H. Oaks of The Church of Jesus Christ of Latter-day Saints, and Executive Vice President of the Federalist Society Leonard Leo. Roger Hertog, president of the Hertog Foundation and chairman of the Tikvah Fund, and Dr. Josephine Templeton, trustee of the John Templeton Foundation, served as co-chairs of this year’s Canterbury Medal Gala. For more information or to arrange an interview with a Becket attorney, please contact Melinda Skea at  media@becketlaw.org or 202-349-7224. Interviews can be arranged in English, Chinese, French, German, Portuguese, Russian and Spanish.